San Francisco: CA. Editor: Mrs. Mattie P. Owen and Mrs. Rose L. Bushnell. 1/2, April 1891-1/8, October 1891. Illustrated with photographs. $2.50 a year. 64 pp., 7 x 10, very well laid out. Owen and Bushnell published the first issue of the journal on January 15, 1891 under the name of The Golden Gate. Both women had worked for an antecedent journal, the Golden Gate, of which Owen’s husband had been editor. When it ceased publication in October 1890 they thought that they had an agreement with the directors to continue publishing under the same name and published their first issue. They were disabused of that notion (one of the directors is reported to have said: "You don't suppose we were going to let those women run the paper, do you?") and they continued the journal thereafter as The Golden Way, calling the first issue (April 1891) volume one, number two. They dedicated the journal "To the Patrons of the 'Golden Gate.'" 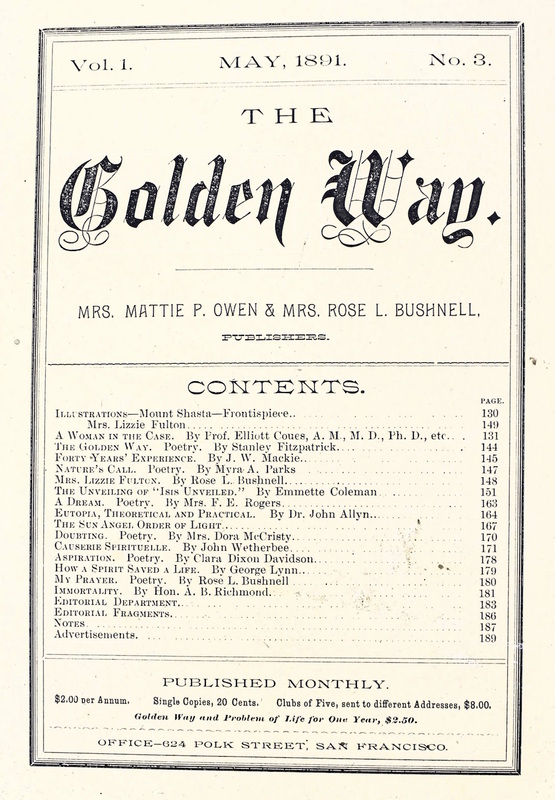 Golden Way 1/2, April 1891. It lasted until no. 8, October 1891. The journal contained an important series of articles by W.E. Coleman ("The Unveiling of 'Isis Unveiled'") on H.P. Blavatsky’s supposed plagiarism, and featured contributions by W.J. Colville, Cora L.V. Richmond, Hudson Tuttle, Elliott Coues, Annie Besant, B.F. and Sara Underwood (on their psychic experiences), John W. Mackie, and others. It also featured articles and advertisements (as had The Golden Gate before it) for something called The Sun Angel Order of Light of Oswego, NY, which expounded the revelations of the Spirit Saidie, "Leader of the Oriental Band in the Heavens." (the Sun Angel Order of Light's communiques had also graced the pages of the Golden Gate). A sample: "Here on this bright shore you will remember as if the events were but yesterday the actual life so dear to you. The sail upon a crystal lake or river, the ministry of angels, their words and songs, the mooring of a boat . . . the garden of blooms, and the song of birds will pour o'er the returning spirit . . . ."). Further on this may be found in [John B. Fayette], Voices from Many Hill Tops, Echoes from Many Valleys, or the Experiences of Spirits Eon and Eona, in Earth Life and Spirit Spheres, in Ages Past, in the Long, Long Ago, and their Incarnations in Earth Life, and Other Worlds, Given through the Sun Angel´s Order of Light (Springfield, MA, 1886) which describes in detail the spiritualist utopia that exists on various planets. University of California, Berkeley; Lily Dale; Huntington Library; California Historical Society.